How can artistic intervention help us explore innovation and challenge siloed thinking in the complex world of data systems? One of the big challenges facing us today is to make sense of the ever-changing, complex systems that operate around us, systems which often mediate our interactions with businesses, governments and each other. Increasingly, the Internet of Things (IoT) operates at the heart of the diverse systems which connect, monitor and control our data, data which mirrors and describes almost all human activity. The implications are huge. But do we truly understand these systems that are increasingly, and invisibly, part of our everyday? And how much do we need to know in order to trust them? Art is a powerful lens through which we can make sense of the world around us and our place within it. Arts practice acts a kind of laboratory in which we raise questions, test our assumptions and consider the ethical, legal and moral challenges of why things are done the way they are. In this ‘lab’, different perspectives emerge to clarify complex problems, illuminate obscured dangers and signpost directions for safe passage. In the drive to make computing invisible it has become intangible. The sheer complexity of today’s IoT systems renders them opaque and difficult to grasp, even for those with expertise in adjacent fields. The challenge is to reclaim transparency, to demand investigation into societal impact. Art places us – our perception, emotional connection and intellectual stimulation – at the centre of the encounter. So, what better way to investigate a new technology or process than to bring the human experience right to the fore? IoT technologies are being developed and deployed to serve all kinds of personal, civic and business needs; from smartphone sensors to remote controlled home appliances, health monitors to mass transit systems. To respond to this emerging sector, the IoT Large Scale Pilots Programme was launched in 2016 with the aim to ‘foster the deployment and evolution of IoT solutions’. Each of the 7 projects that make up the Programme is exploring how advanced IoT technologies can be used in real-life challenges and contexts across Europe. The Programme includes 5 Large-Scale Pilots (LSPs) which are intended to prototype systems that can work at the scale necessary to make a difference. With a total funding budget of €100M, the LSPs address five different IoT Focus Areas including smart living environments for healthy and active ageing (ACTIVAGE) , wearables and solutions for smart open-air events (MONICA), automated and connected vehicles (AUTOPILOT), smart agriculture and precision farming (IoF2020), and smart cities (SynchroniCity). In the framework of the IoT LSP Programme, CREATE-IoT is a Coordination and Support Action which, together with U4IoT , provides support to the LSPs by highlighting possibilities for partnerships or shared learning. In particular, CREATE-IoT aims to create space for collaboration between the LSPs, generate greater visibility of IoT projects with the citizens of Europe, and explore the evolution of IoT ecosystems. In the framework of CREATE-IoT, FutureEverything works alongside the other partners to demonstrate the value of artistic intervention in sparking innovation and fostering challenging debate. When striving to invent new technologies or to solve problems categorised as engineering or technical, to think of the how above the why, industry and academy can often end up in silos of their own making. Agile technological development offers a key to rapid innovation, often delivering world-changing products and services through a profound focus on product. However, the pace of this technical advancement, this relentless drive towards the future, offers few moments of reflection. The institutions which have previously served as an ethical counterweight to the ambition and reach of business are struggling to play catch-up, unable to develop the hybrid skills necessary to have a rich understanding of the challenges presented. Art offers a means to interrogate new advances in technology and the challenges that accompany them, to shine a light below the surface and to bring shape and context to the otherwise unseen. But make no mistake, art isn’t just a way to dress technology in a distracting outfit, to smooth the sharp edges of a vital discourse to make it palatable. Art offers us a means to humanise the debate through public participation and collaborative co-creation, necessarily bringing moral, civic and ethical questions to the table. 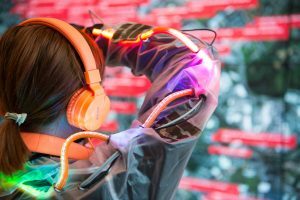 Artists like Kasia Molga and Giulia Tomasello are creating imaginative interfaces and open infrastructures in response to, and in collaboration with, new tech products and data systems. They create visibility and awareness around both the capabilities and the consequences of these systems and, in so doing, enable people to understand and experience potential future scenarios. These artists and their works are opening up space for critical engagement that wasn’t previously available. This is where interesting and magical things start to happen: curating conversations that cut across sectors; breaking apart silos to consider innovation in technology at the same time as civic responsibility and societal need; working together to diversify the debate and emphasise inclusion as a communal necessity; bringing together technology leaders, artists, activists, entrepreneurs, academics and other curious citizens to consider possible futures and, in this process of participation, co-creating products, solutions and pathways. The results are both more innovative and more rooted in the human not the machine. Through our events and collaborations we’re striving to create the space for these conversations and collisions to happen, coaxing thinkers from their ivory towers and revolutionaries from their barricades, inviting business and government to bring entrepreneurial drive and civic spirit. For these conversations can’t simply happen at the conceptual level, but must operate in an experienced reality, in a real room with real people working towards real outputs. But are there rules of engagement? How do we find a common language? Is there a ‘right’ way to bring art, technology and people together? Since 2008, FutureEverything has pioneered an approach called Festival as Lab. This is a variant of a design process known as the Living Lab, which aims to test ideas and prototypes in real-world situations. Festival as Lab comes alive in the temporary and rarefied atmosphere of a city-wide festival, a process which enables artists and designers to work with engaged citizens in playful new ways, and with systems and technologies they could not otherwise access. To burrow deep into the DNA of the city and transform it into a playspace, enabling both practitioners and the public to reconfigure their everyday and to imagine the kinds of futures they would prefer. This journey of re-imagination continues with FutureEverything festival’s current incarnation: Future Sessions. This ongoing series of workshops and events put into practice the action research methods used to explore the collision between the art and tech sectors. Through this kind of open engagement, we hope to find ways to creatively influence policy and bring about positive change. This new, lightweight and portable festival model kicked off in March 2018 with Future Sessions: Trust in Invisible Agents, in Manchester. This began an investigation of what we consider to be the key themes of transparency, ethics, literacy, and governance which thread through the Internet of Things ecosystem. In September of this year, we were able to continue this conversation by means of a roundtable discussion at the Ars Electronica festival. Working as part of this ‘internationally unique platform for digital art and media culture’ held every year in Linz, Austria, allowed us to bring together a disparate group of participants from across Europe, by both serendipitous accident and deliberate design. Future Sessions: Ars Electronica was a half-day workshop beginning with an expert panel of lightning talks intended to inspire and bring context to the debate. This was followed by an interactive roundtable session which brought together panel members and audience participants into a shared conversation. The panelists – industry experts and scholars, artistic practitioners and curators – combined forces with the session attendees to debate themes of transparency, literacy, ethics and governance in the IoT. 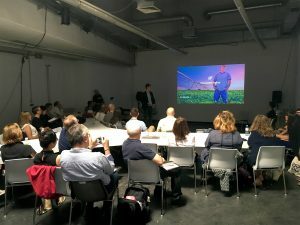 The event was grounded in practical examples of IoT technologies, with representatives of some of the EU-funded Large Scale Pilots bringing to the table their experience of these hugely complex, sector-wide projects. Artists and curators drew on their own detailed conceptual and technical understanding of their practice to add nuance, raise questions and help the conversation break out of silos. Throughout the session, this diverse group of thinkers worked together to explore artistic intervention as a means to innovate, challenge and explore possible futures. By the close of the session the group had come up with a number of strong ideas which might shape this kind of intervention. With the guiding hand of moderator Drew Hemment, the first iteration of a potential Manifesto for Art in the IoT was composed, channeling the expertise of the participants into a concrete outcome. Our host for the day, Drew Hemment (FutureEverything Founder and Chancellor’s Fellow at the University of Edinburgh), kicked off the conversation with a challenge around TRUST, asking: in today’s vast sea of data, how can art create visibility for data practice? 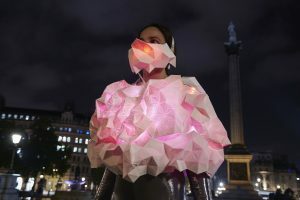 Drew’s words were closely followed by Fault Lines artist Kasia Molga, who spoke about her work Human Sensor LDN, a digital artwork and performance that visualises exposure to air pollution using wearable technology. In her talk, Kasia used storytelling as a way to bring potential futures to life in the minds of the audience, inviting them to question the systems around them. Shifting gears from Kasia’s fireside chat, Alexander Berlin brought into the room his expertise in the IoT and business models. A startup developer and investment adviser, Alex leads business support at the Internet of Food and Farming LSP (IoF2020). This project aims to instigate a paradigm shift in the agricultural sector through the use of IoT equipment and networks to boost productivity and sustainability. His talk drilled down into the ways IoT technologies can help us build trust in the provenance of our food supply, but urges us to be wary of poor security models which might lead to the poisoning of data through accident or malicious intent. Next up, we heard from STARTS Prize Winner Giulia Tomasello, an Interaction Designer and Researcher specialising in wearables and biotech. Like Kasia, she spoke about our physical interaction with data systems and how these can be harnessed to create very real benefits to things like personal health and cultural discourse. At the same time, she noted that our individual relationships with data are becoming increasingly personal in nature, and spoke of a need to question our own interactions with systems that by their invisible nature are not transparent. Picking up the thread of how the IoT creates meaningful benefits for the user, particularly around health, Dr Martin Serrano (Data Scientist and IoT Unit Director at Insight) extolled the virtues of IoT technology, while acknowledging Drew’s original premise around the challenge of building Trust. He left the room questioning: how can we best communicate the benefits of IoT? To round off the lightning talks, Irini Papadimitriou (Creative Director, FutureEverything) spoke about issues of consent and echoed themes from earlier in the day around the increasingly personal nature of our interactions with data systems, asking: do trust considerations increase even further when technology is not just invisible, but actively mimics human behaviour and interaction? More than sixty Ars Electronica delegates engaged with the panellists’ talks, in amongst one of the busiest arts and technology festivals in the world, every loud noise from outside the workshop room a reminder of the countless attractions peppered throughout the festival site. After this inspiring round of lightning talks, we brought the room together to discuss the provocations and issues raised by our speakers around four core issues of transparency, literacy, ethics and governance. In order to do this effectively, we had a series of conversations which were each focused around one of these core issues, although, of course, they are all closely intertwined. Each conversation was led by a moderator, who helped direct the flow of debate and keep us on track. 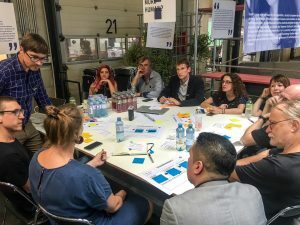 Using a design canvas as a framework, and post-it notes to attach ideas to the framework, all of the participants were able to highlight issues and propose solutions which were of particular importance to them. Then, through further discussions, the different perspectives of the people around the table allowed us to build a strong but subtle picture of ideas that were important to all of us. Following the Future Sessions roundtable, Ars Electronica played host to the STARTS Day micro-conference, where STARTS stands for Science + Technology + the ARTS and represents a comprehensive series of initiatives from the European Commission in the sector. This full day event brought artists, creative professionals, scientists and industry representatives together to present STARTS collaborations and art-science residency programmes from around the world. 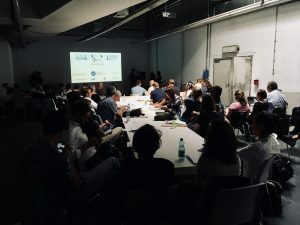 FutureEverything, as part of CREATE-IoT project, was invited to talk about ideas for artistic intervention in the IoT, drawing on past experience and future plans, and to present the results of the roundtable: the work-in-progress manifesto. After listening to an inspiring range of great speakers, such as Julia Kaganskiy (US) and Christophe De Jaeger (BE) in a session chaired by Lucas Evers (NL) of the Waag Society, I delivered a talk which described the bones of our co-created manifesto and signposted its future development. We’ll be uploading a video and transcript of the talk in due course so watch this space! So, what did we learn about creating models for co-creation, conversation and collaboration? It’s important to democratise the conversation – to allow room for all voices, seeing speakers, artists and audience alike as experts. There is real genuine value in getting art, tech and people together – it generates a richness and diversity in the conversation – although you have to be ready to be flexible, to go wherever the debate takes you, and able to bring it back around to something actionable and real. There is real value in creating visibility for these large scale pilots and putting them under the inquisitive noses of the curious general population. At the end of the group session Drew Hemment, in a sterling effort, managed to synthesise the masses of post-its and copious notes into a short list of proposed, very first draft, manifesto points. This iteration is just a first tentative step. The manifesto for Art in the IoT is something we’re committed to developing, and we’ll put out a call for action to anyone who wishes to co-create the next version with us. The article was authored by FutureEverything. You can read the original article on the FutureEverything blog.